Contributing to the betterment of the communities within our service area. 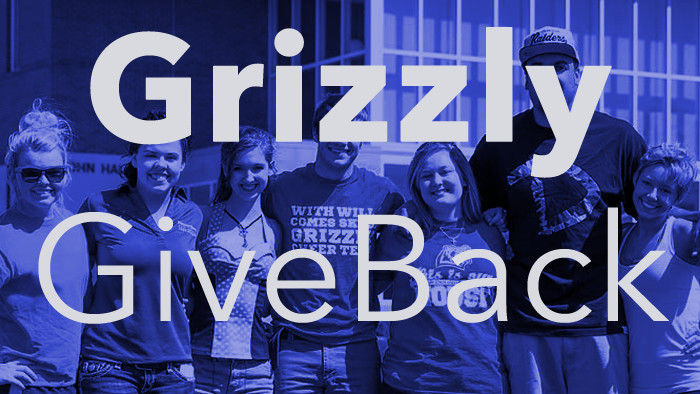 The Grizzly GiveBack is an initiative designed to encouraged volunteerism and service learning. Students, faculty, staff, alumni and University Board members can log volunteer hours through the Grizzly GiveBack. Volunteering is one way you can get involved in the greater community and help contribute to social change. Through volunteering, you are making a larger impact in the community than you can ever imagine. Community service happens everywhere! From soccer moms to elder care, from civic clubs to cleaning streets, we offer our services joyfully. Not sure where to start? Check out the list of ongoing opportunities and the upcoming opportunities. Have a community service or volunteer opportunity you’d like to report? Have a question, suggestion or comment? Use our contact form to tell us about it. Volunteering is freely giving of your time and energy in lieu of monetary compensation. To help clarify, a donation, i.e. giving money or items to a nonprofit organization is a great way to give back, but it doesn’t count as volunteering. The President’s Volunteer Service Award is the premier volunteer awards program, encouraging United States citizens or lawfully admitted permanent residents of the United States through presidential recognition to live a life of service. See more information on the award. Individuals who have completed 4,000 or more hours in their lifetime. Please enter volunteer hours for the time frame beginning July 1 of last year through June 30 of the current year by the October 31st deadline. Awards will be announced at the Annual Faculty and Staff Luncheon held each January.